What a dashing young man! 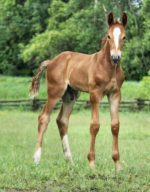 This colt is eye-catching, with his long perfect legs, solid uphill frame, and well-set head and neck, all wrapped in a golden coat. And he can move – 3 correct gaits, with lots of bounce and power from a strong engine. 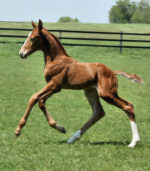 I believe there is a dressage future in store for the elegant, good-moving colt. And a pedigree that includes Sir Donnerhall, Weltmeyer, and Ramino would support that hypothesis. Sire Sir Gregory is a handsome, powerful stallion (Sir Donnerhall / Don Gregory) who competed successfully through Prix St Georges before focusing on a breeding career, at a young age. 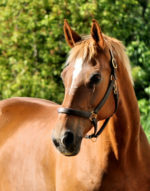 Skibereen’s dam was Champion Foal at her German Hanoverian Inspection, and earned 2 “1A” prizes at 2 and 4 years of age, when she also completed a successful Mare Performance Test, before beginning a dressage career with her amateur owner. Happily SOLD to Paula in South Carolina. 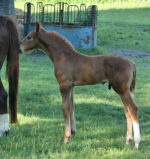 Pictures show Skibereen from 2 days to 3 weeks, plus pictures of sire and dam Video is from Skip’s first day out, at 2 days old. 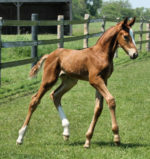 Second clip is of Skibereen, chilled at morning pasture, 3 weeks old, then in the baryard at 3 months old.